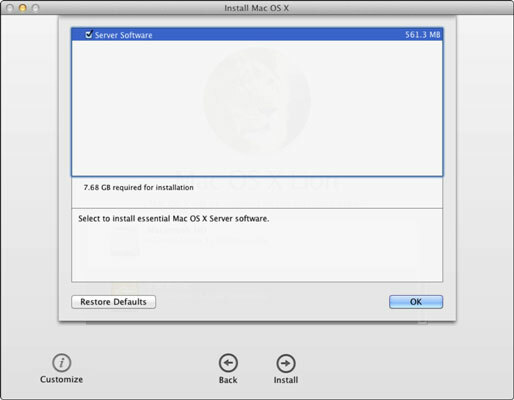 Upgrading your Mac hardware from the Snow Leopard Server to Snow Lion Server is a straight forward process. 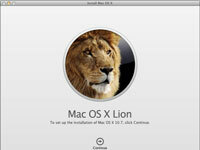 1Launch the Install Mac OS X Lion application. You can launch from the Applications folder of the volume you booted from. 2Click Continue in the first window. The Mac OS X Lion installation screen appears. 3Click Agree in the license agreement window. Then click Agree in the license agreement dialog that appears. 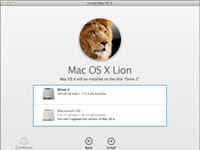 4Choose a driver or partition on which to install Lion. The installer lets you select only drives that are either empty, formatted drives, or that have the client or server version of Mac OS X 10.6 or 10.7. If you’re trying to install on a drive with an earlier version of Mac OS X installed, quit the installer and erase the drive. 5If you’re booted from Mac OS X Server and installing to an empty drive, click the Customize button, select Server Software in the sheet that appears, and then click OK. This option shortens the installation process, and you won’t have to go to the App Store. However, the Customize button is grayed out and not available if you’re not booted from Mac OS X Server and installing to an empty volume. Time for a cup of coffee. A progress window appears, telling you that it is downloading components. The Mac restarts when this step is finished. Another dialog appears, telling you that it is installing software. The Mac restarts a second time when it’s finished. 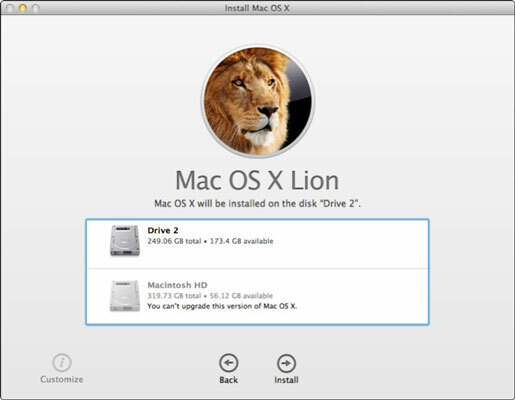 If you booted from Mac OS X Server and are installing Lion Server on an empty drive volume, you can skip the following steps. You are done. Otherwise, continue on to register your software and make migration selections. 7Select the country in which you’re registering. Click Continue. The Keyboard screen appears. 8Select a country for your keyboard. Transfer the Information from an Existing Server: Select this option to move settings and user data from another server or volume or drive installed with Mac OS X Server 10.5.8 or later. A series of screens appears in which you select a server or drive. Restore from a Time Machine Backup: The backup would have to be on a drive attached to the Mac or on a network attached storage device. The Time Machine backup must be from Mac OS X Server 10.5.8 or later and must have a static IP address configured. Setup a New Server: Select this option if you aren’t migrating from another server. 10Enter an Apple ID and password and click Continue. Use your organization’s Apple ID that was used to purchase and download Lion. 11In the Registration screen that appears, type your name and contact information and click Continue. The installer may supply info for you based on the Apple ID you entered. 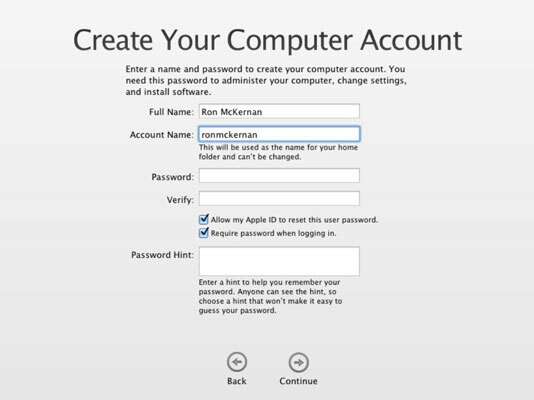 The Create Your Computer Account screen appears. 12Enter the name and password for the first administrator account and click Continue. A short name is created. This name is the local administrator account name for the server Mac. It doesn’t have to be a person’s name. The Thank You screen appears. 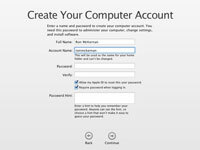 You can now log in with computer account and password you created in the preceding step. The Lion Server is now installed and booted.